National Preparedness Month (NPM) 2018 began on Saturday, September 1. This year's theme is Disasters Happen. Prepare Now. Learn How. Each week will highlight tips and steps to take an important preparedness action. The theme for the first week of NPM, September 1-8, was Make and Practice Your Plan. Learn how with steps from the Ready Campaign: Make an emergency plan, including how you and your family/household will communicate after a disaster; sign up for alerts and warnings in your area; and learn your evacuation zone and make an evacuation plan.Take action this month to prepare your family, organization, or community. Register your preparedness activity. You can find more resources, including the NPM social media toolkit, at www.ready.gov/september. On Sunday, July 1, 2018, thirty Amateur Radio operators from the Hudson Division supported the 18th running of the New York City Triathlon. This year's event provided some substantial challenges for competitors, spectators, and volunteers alike, with air temperatures already in the mid-80's at the 5:50 AM start time, with heat indexes rising to 107 degrees near the conclusion of the event. The 2XU® NYC Triathlon is not your typical marathon event. Athletes must first complete a 1500-meter swim in the Hudson River, then run to one of two Transition Areas where they doff their wetsuit for cycling apparel and complete a 25-mile loop on the Henry Hudson Parkway to the Bronx, then return to Transition for a changeover to the run segment -- a 6.2 mile (10K) route into the Finish Line in Manhattan's Central Park. the Swim Exit Barge, where athletes leave the water to run to Transition; and the "B-Dock," where athletes needing immediate medical attention are transferred for extraction from the water. Hams are always the extra eyes and ears, working with the safety team to ensure a safe event. Unique to this NYC-area event is the assignment of ham radio operators on motorcycles to patrol the four zones that make up the Bike segment. Pete Santorella, KC2QXC, Harvey Klein, WS2Q, Carlos Varon, K2LCV, and Ed Akins, KD2OOF, ride in the emergency lanes along the bike route and report athletes with mechanical or medical problems to the Net Control Station in the Command Center. The "Moto-Hams" are given a bag of bike parts and tools that they can offer an athlete with mechanical problems - but under the rules the hams cannot touch the tools or help make repairs. Most of the time, the athletes are able to make their own repairs and get back underway. Pete, KC2QXC, one of the "Moto-Hams," along with Ham Radio Coordinator Mike Hoeft, K2MPH, and net control operators Jamieson Provan, N2WNU, and Rob Yenis, KC2ILP (seated), in the Command Center. (photo courtesy K2LCV). Stations (Rob Yenis, KC2ILP; Jamieson Provan, N2WNU; and Stu Siet, WA2JNF) on the Swim, Bike and Run Nets, respectively, are in the Command Center along with event supervisors and representatives of NYPD, FDNY EMS, and other key agencies all working in a Unified Command structure. The Incident Commanders (IC) have come to rely on the hams for situational awareness, and they are glad to be in a position to provide it. Northeast Ohio ARES operators were busy as they responded to an activation for damage assessment, and participated in two major exercises all on Wednesday, August 15, 2018.
majority of northeast Ohio counties. More than a dozen ARES operators responded along with a contingent of CERT volunteers from a neighboring county. The volunteers held a short briefing, then began the long task of going door to door to inquire about damages. The surveys continued Thursday, with a morning crew made up of CERT and VOAD volunteers, and an afternoon crew of all ARES volunteers. The assessment was expected to continue. That call came when other northeast Ohio counties were already involved in two major exercises - one at the Cleveland Burke Lakefront Airport where six ARES volunteers assumed the task of tracking patient transport in a multi-casualty drill. The other involved nearby Lake, Geauga and Ashtabula counties as the state conducted an exercise involving the Perry Nuclear Power Plant. More than two dozen amateurs there and five at the Ohio state EOC's station, W8SGT, followed the day long exercise. Primarily an EOC exercise, each of the counties dispatched ARES members to different locations as part of the drill. 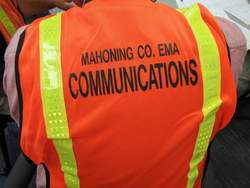 The Ohio EMA confirmed later that the Ohio ARES volunteers helped assess 416 homes, four of which were totally destroyed, one had major damage and the other 411 homes sustained minor damage. Minor damage is considered anything with two feet of water or less in the basement, or first floor if it is a home without a basement. There were 74 city streets surveyed for damage. ARRL Ohio Section Manager Scott Yonally, N8SY, said "It just shows how ARES groups can work together and help our local government agencies with manpower, even when it's not primarily a communications event." On August 20, Mahoning County EMA Director Dennis O'Hara wrote to the county ARES group volunteers: "I would like to thank you for assisting and coordinating with the ARES volunteers to conduct [the] damage assessment . . . We were able to make positive contact with over 400 homes and businesses on 70 plus streets in the affected areas." O'Hara wrote "I am proud of the coordination between the EMA and ARES. I look forward to working with ARES and continuing to foster the relationship between the organizations. . ."
The San Francisco 2 Meter FM QSO Party is a contest sponsored by the San Francisco Radio Club (W6PW) and designed to give 2 meter operators -- both beginner and veteran alike -- the chance to participate in a fun radio contest that helps them learn their radios and the skills necessary to operate them for more demanding situations such as emergencies, disaster responses and public events support. The QSO Party takes place every summer and this year it was run on Saturday, August 25th, from 10 AM to 2 PM Pacific Time (1700-2100 UTC). Contacts are limited to FM simplex on the 2 meter band, and at least one end of the QSO must be within San Francisco. There are three exchange items: call sign, operator's first name, and Zip code.There are three power levels: QRP - 10 watts or less (handheld); Low - 10-100 watts; and High - 100 watts or more. 146.415 MHz and 146.550 MHz, with a PL tone of 100 Hz. Participants are advised to listen before transmitting, making sure the frequency is not in use, and move to an open frequency if it is in use. A log sheet is available, and Joe Humphreys, WA3TSP, has written a logging program for computers running Windows: www.sfsunset.com/logger. Each station worked is worth one point. A Fixed station may be worked only once, while a Mobile station may be worked more than once if it has moved to a different Zip code. The multiplier is the number of different Zip codes worked. Although Hurricane Florence is not expected to strike the MDC Section directly the residual effects will. Maryland Governor Larry Hogan and DC Mayor Muriel Bowser have declared States of Emergency in advance of the arrival of Hurricane Florence. In other section news, Maryland-DC Section Emergency Coordinator James Montgomery, WB3KAS, has announced that he and Wanda Montgomery, KA3AHI, continue to schedule visits/presentations to as many ARES and club groups throughout the section as possible. The topics are "Section Interoperability" and the "Section Health Care Emergency Communications Program." ARES Supports Active Shooter Exercise -- In Clallam County, Western Washington, the members of our ARES group are not just waiting and training for the "Big One," the Cascadia Earthquake, or helping out with local marathon events. For the second year in a row, members of the Clallam County ARES group were part of an Active Shooter Training Exercise. As shootings at schools and public gathering points keep increasing, the authorities keep working on preparing for these incidents. 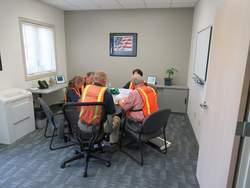 The Clallam County Sheriff's Department conducts training each year to educate as many first responders as possible in the proper techniques of conducting operations during these incidents including neutralizing the threat, evacuating victims, and reuniting families of victims and offering counseling to all who need it. Safety is a major concern during these exercises and procedures. In this latest exercise on August 10, 2018, there were officers from a nearby prison, tribal police, sheriff's deputies, ambulance crews from four local cities, the local County Fire personnel, and even the Coast Guard as part of the evacuation effort of injured. ARES personnel provided communications between the instructors and locations being used so that all of the regular communications that would be and are occurring on the various agencies' radios is not interfered with by training traffic. ARES establishes communications between the command instructors and all remote locations during the drill including the hospitals, the reunification center, the EOC, and anywhere else required. A lot of the schools where this training occurs are in somewhat remote areas. Coordination among agencies is a key concern. During this exercise the Coast Guard responded and landed on the school football field as part of the exercise to pick up a victim for transport to the nearest hospital. In the case of this school, the nearest hospital is 35 miles away. The Park County (Colorado) Radio Club (PCRC) provided communications for the first Colorado Make-A-Wish Trailblaze Challenge fundraiser hike on August 11th, 2018. The challenge hike took place on Segments 2 and 3 of the Colorado Trail totaling 23.7 miles. The elevation at the start of the Challenge hike was 6112 feet and at the highest point reached 8290 feet for a total elevation gain from start to finish of 2178 feet. The average grade along the trail is about 5% but at places the grade exceeded 18%. Northwestern Colorado Amateurs Support Road Rally with Communications, Gain Access to Towers and Radio Installations -- Northwestern Colorado ARES and AuxComm members supported the Rally America the last two years, but no amateur service repeaters/towers were available to completely cover the area. Rally organizers counted on hams for communications for the safety of the road rally drivers. Colorado Section Manager Jack Ciaccia, WM0G, said "we were able to support them due to our Colorado Department of Homeland Security/Emergency Management and Department of Public Safety relationships and were given 100 handhelds by DHS to be used on the Public Safety frequencies in the area on State-owned repeaters." "We were able to effectively support this Road Rally event," Ciaccia said. But more communications and coverage were needed. "This event is important to the economy of the small northwestern Colorado community of Rangely and the requests to the State for radio communications came from both the County Sheriff and the City Council," he said. They recognized that Amateur Radio was the best option for event communications. Ciaccia said "So for this year, we decided to put in permanent DMR gear and tie it into the Colorado statewide DMR system (34 statewide repeaters), so we can program the frequencies and channels for the road rally, or whatever else needs communications there, when needed and then leave the DMR repeater open for routine ham communications the rest of the time. Our Colorado AUXCOMM relationship with our State allows us to place antennas and repeaters on State or County-owned towers and repeater sites." 1) Get an email address for your organization (yourARESgroup@gmail.com). Gmail is free and easy to setup. This will open many additional options for you. 2) Once you get a Gmail account, get a Google Voice Number. This is also free and makes it easy for people to contact you. In our county, the Google Voice number is forwarded to the cell phone of one of the AEC's or PIO, so that it can be answered when people call. It makes your organization look much more professional and people-friendly when the caller gets an actual person on the phone. 3) Have and maintain a website. It is one thing to HAVE a website; it is yet another thing to MAINTAIN that site and keep it with current information. In this case, WORDPRESS is your friend. A WordPress site is relatively easy to setup and very easy to maintain and add content. a. Google Calendar - add events to the calendar and share the calendar with the public so they know when and where you have events. b. Google Photos - here you can upload photos of your events into Galleries. Add the links to these galleries to your website for everyone to see what you are doing. c. Google Docs - upload important documents for your organization here and make them accessible to those who need them. 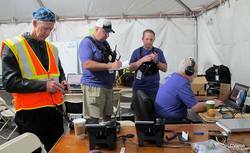 Plan now for the annual Fall classic, the ARRL Simulated Emergency Test (SET). Click here and scroll down for complete SET guidelines and reporting forms for Emergency Coordinators and Net Managers. The primary League-sponsored national emergency exercise is designed to assess the skills and preparedness of ARES® and other organizations involved with emergency and disaster response. Although the main SET weekend this year is October 6-7, local and section-wide exercises may be held throughout the fall season. DC power management has become a sub-hobby for me: I have two 100 W solar panels on the roof of my shack, two 31 A/hr gel cell batteries, a heavy duty 60 A power supply, a VHF FM radio and an HF transceiver, all fed by wires terminated with Powerpole® connectors, and managed/connected by a high power (40 A) routing/battery charging device. I changed all of my connectors to the now-ubiquitous Powerpoles years ago and never looked back. Two aspects of 12 V power management systems are often overlooked by amateurs, admittedly including myself: length and gauge of wires. Power is saved when runs are kept as short as possible, and of a high (lower number) gauge (AWG). The power supply wire should be heavy gauge (#10) and kept as short as possible. The same applies to the batteries, which should also have a fuse in the positive lead directly at the battery's positive terminal. I also placed quick, simple and inexpensive volt/ammeters with Powerpoles at all connections. I bought them from Quicksilver Radio here. One final note, and it's an important one: Be Careful! Any short in the battery wire, connector, or load can cause a fire and battery explosion. People almost never think of 12 V batteries as dangerous, but they are. Use the utmost of care when wiring your 12 V management system!